The exquisite furnishings and fine art in Sotheby’s vast collections come to life this spring for the third annual Designer Showhouse and Auction. For the dazzling display, which runs April 9 through 16 and culminates in an auction on the 17th, the New York–based auction house has tapped 12 noteworthy interior designers and firms to create one room in a “home” in its midtown Manhattan headquarters. Designed by household names like AD100 designer Bunny Williams as well as newcomers such as Patrick Mele, the rooms are sure to run the gamut in style. 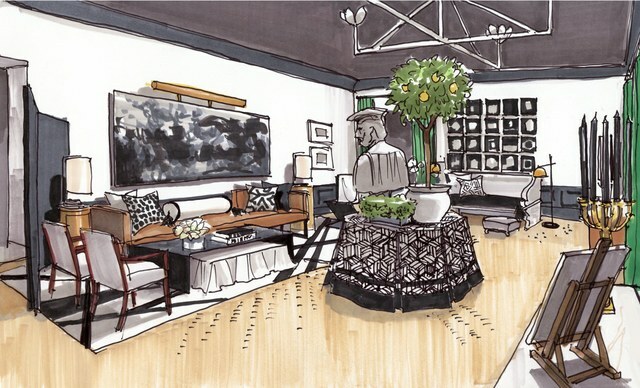 For a preview of what’s to come, we’ve rounded up sketches from nine of the designers and asked them about the room that’s in the works.